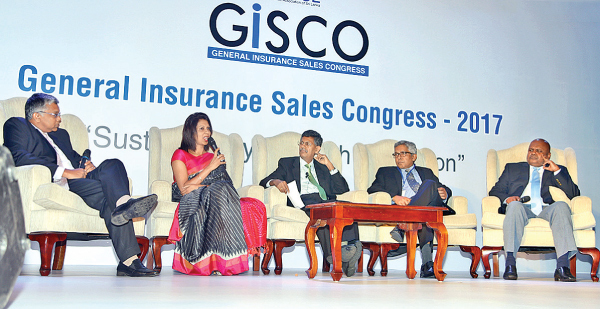 Insurance companies should harp on new product diversification and innovation aiming tailor made solutions, said IBSL Chairperson Indrani Sugathadasa at the General Insurance Sales Congress (GISCO) held for the second consecutive year at the Waters Edge with the theme, Sustainability through Innovation. “General Insurance business in Sri Lanka is over relying on motor insurance. Not to put all your eggs in one basket, “ she cautioned. Sugathadasa further stated the fraternity should penetrate untapped markets with a futuristic vision since success depends on both growth and sustainability. “Sales forces are the ambassadors of insurance business. They must play customer-oriented multiple roles,” she urged. GISCO participation comprised insurance whiz kids, IBSL officials, re-insurance brokers, foreign insurance experts and sales personnel. Executive Director, SSMI Europe Dr Fabrizio Majorama said insurance agents must be uber-proactive and companies should adapt both ‘push’ and ‘pull’ strategies to attract customers. “Efficiency can be measured. Quality, feasibility, ROI and processes must be intact. Client perceives quality, not processes. Hence re-engineer processes to satisfy customer in minimum possible time. Too much strategy kills execution. Be light, and be fast,” he said. Ceylinco General Insurance CEO Ajit Gunawardane said insurance companies should sell insurance instead of prices. “Be in the ‘hot seat’ instead of adhering to structured approaches which does not stimulate innovation. Lots of opportunities for the insurance fraternity are on cards. Companies thus should focus on both ‘top line’ and ‘bottom line’ while harping on product innovations and distribution enhancement,” he said. Alliance Insurance CEO Surekha Alles said ‘Sachet Insurance Covers’ are fast gaining momentum in the world and it is high time local insurance industry started introducing ‘one-day’ and ‘one-hour’ Covers. “Online products are fast becoming major rivals for global insurance companies. If Google or Apple gets into insurance business they will have a global penetration. Hence insurance companies must adapt newest technology to cater to a whole new set of customers emerging which is also a vast untapped market,” she said. Insurance Association of Sri Lanka President Deepthi Lokuarachchi said the local general insurance sector is yet to realize potential available to develop markets. “Though a lion’s share is taken by the ‘premium’ growth rates, we should achieve that by concentrating on untapped markets,, he urged.